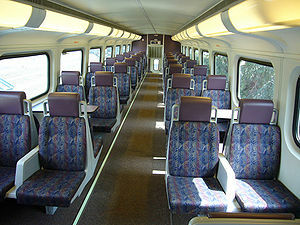 Metrolink is a commuter rail system serving Los Angeles, Orange, Ventura, Riverside, and San Bernardino counties. The hub of the system is Los Angeles Union Station. 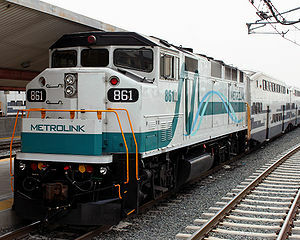 Metrolink connects with Amtrak, Coaster, and Los Angeles Metro Rail. Before boarding the trains, buy your train ticket from a Metrolink ticket machine. Fares on Metrolink are determined by the distance you plan to travel. Metrolink uses the proof of payment system and passengers caught without a valid ticket or pass are subject to eviction and/or citation. Check the schedule for departure time. If the station features multiple platforms, see destination signs (on the side of the train) or check with train or station crews for the correct train. The train conductor will announce the train stop before arrival, so be prepared to exit the train before the train stops. All Metrolink trains allow 3 bikes per car. Use the velcro straps to secure the bicycle. Some trains (mostly on the Orange County Line and San Bernardino Line) offer a designated bike car with 18 bike spots. Metrolink is accessible to people with disabilities at all stations. Disabled riders should wait on top of the mini-high platform. To board those trains, conductors will deploy a ramp to bridge the gap between the vehicle and the mini-high platform. This page was last edited on 12 November 2018, at 14:12.